THE BRITISH RAILWAY STORIES LTD: "The British Railway Series - Update"
Recently I asked a chap by the name of Dean Walker if I could commission a few pictures from him, towards making some charity prints later in the year. He agreed, and the above is a small section of a larger painting. His work is absolutely phenomenal - please look out for it on Deviantart. So many people have asked me about Episode 18, the book, the website, and general ambitions for the series, that I felt it prudent to give an update of some form! Episode 18 is still on the cards, but is a highly ambitious - and to date, incomplete script, that I would like to produce as the next The British Railway Series short film, by the end of 2011. With any luck, I should be able to divulge a few more details on the special, by the end of July, which is my self-imposed deadline for scripting and story-boarding. The one thing I can make clear about the short film, is that we're looking to change the look of the characters significantly, as a result of remodelling the faces. These faces are still very much in the early stages of development, and are being created by Richard and Sean, the admins of Sodor Island 3D. The above photograph shows one of the prototype Stephen faces, being tested. The faces will remain static, but there will be a greater range of expressions for all the characters, new and old. Please feel free to write in and tell me what you think of the above face, at the copleyhill@live.co.uk blog. 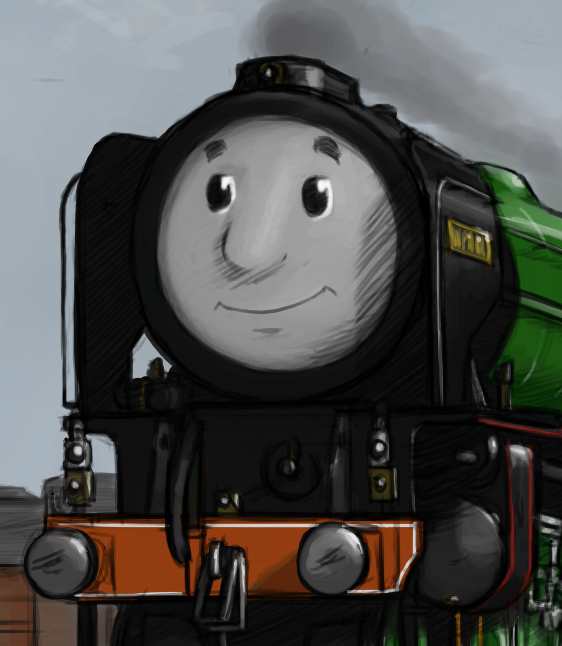 On the series' Facebook Group, I posed a question: What type of locomotive would you like to see in The British Railway Series? 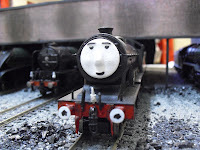 The response was sterling, a total of fifty six of the members of the Facebook Group responding, the top three locomotive classes coming from three different regions. The first placed locomotive type was the Great Western Railway Castle Class, the second was the Southern Region Bulleid Pacific, and the third was the Eastern Region, Thompson A2/3 Pacific. It was all done for fun, of course, but you never know...perhaps Pendennis Castle, 249 Squadron and Edward Thompson will make an appearance one day! Lastly, there's been a few rumours going around that I am writing a book, and even more rumours as to who I've employed as artist. I won't confirm or deny the rumours, but it has been hilarious to read the emails sent to the copleyhill@live.co.uk address. Some have been so wildly off the mark, it's unreal. One email, however, summed up the situation perfectly: "Of course, you won't tell us if something is happening until it's actually happening". Yes indeed! And on that bombshell, I'll bring this blog post to a close. Thanks very much for those of you keeping tabs on The British Railway Series, and sending in all your lovely emails and Youtube mail. When is the relaunch of The British Railway Series coming already?! Please respond back if you remember that this page exists. Guess what? Very soon as it happens! I have book 2 about to illustrated and I am working on something special for the YouTube fans. I know it's been a long time (Episode 18 was in 2012) but reality and a full time job has kept me from being the prolific YouTuber I used to be. When do you have time off? And what is this "something special"? The first episode of the relaunched series? A Tale of the Unnamed Engine narration/remake? A DVD? (Gasps) A movie of the British Railway Series?